Saddles are a personal thing, of course. A slim and narrow seat with minimal padding might not suit everyone, but this style will be ideal for sportive or training bikes – and the design won't look out of place on fancier racing bikes either. The narrow nose means no rubbing on the inside of your thighs, a major plus in my opinion, although some riders might prefer slightly wider support. A cut-out slot in the middle of the saddle is effective at reducing pressure – and unnoticeable when pedalling. Some cyclists will prefer a larger cut-out, while others prefer a solid top. As with padding and profile, it's a personal thing. Padding here is minimal – a thin layer of gel under the cover – which is no bad thing; for many riders it's the padding in your shorts that counts, rather than the padding on your saddle. Some saddles have extra-grippy panels, but although there aren't any on the 900 Sport I didn't notice myself slipping around particularly. The dimples might be helping here, as well as providing a touch of extra ventilation. The B'Twin 900 Sport retails at £19.99, which is very good value. The low price is not reflected in a cheap look: on the top, the three-colour design is appealing, although some might prefer a single colour, while underneath it all appears well made, with no baggy seams or ugly rivets, although the fabric has frayed slightly in some areas. The rails are chromoly, but despite the lack of exotic materials, the 900 Sport's weight of 247g on the road.cc Scales of Truth is very respectable. Top-end saddles costing five times as much weigh only a few grams less. Usually, only when carbon and/or titanium come into play do saddle weights drop below 200g, but then the price goes up even more. The Selle Italia SLR Team Edition, for example, is 178g and £115. All in all, this is a very comfortable saddle. It's been fine for short training rides, and for a couple of more relaxed 100-mile outings as well. I put it on a bike last month to go for a test ride, and liked it so much that it hasn't come off since. 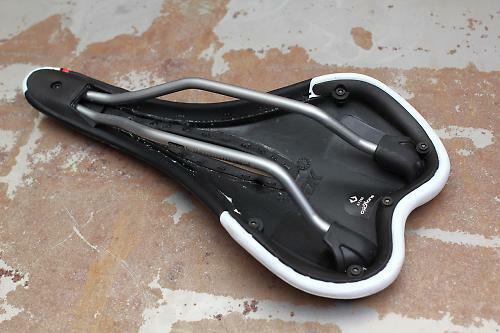 This saddle is aimed at 'sport' bikes rather than, say, leisure or commuting bikes. Short and sweet, but a fair summary. Information on the Technical section of the Decathlon website is even more concise: 'composition - chromoly rails.' But once again, it's a fair summary. Quality of construction appears good. The upper is neat, while underneath the saddle – the usual giveaway spot – there are no baggy seams, misplaced staples or ugly rivets, though there is slight fraying in some areas. Performance is very good, in that I found the saddle very comfortable, but saddles are a personal thing, so it may not suit everyone. At 247g, weight is very good, especially for the level of comfort provided and the very fair price. Comfort is excellent. The limited padding, slim profile and narrow nose all combine to make this saddle ideal for long or short rides. But – as mentioned above – saddles are a personal thing, so it may not suit everyone. Selling for a penny less than 20 quid, value is excellent for the level of comfort provided. That the saddle is well made and reasonably stylish as well is an extra bonus. Overall, the saddle performed very well, in that it was easy to fit and comfortable to ride from the get-go. Not a dislike, but it would be good to see this saddle available in a single colour. This saddle doesn't pretend to be top-of-the line, and it may lack some features of the more exotic brands, but the combination of instant comfort, reasonable weight and very fair price earns the 900 Sport a well deserved score of 8.